Having a distinct sound is possibly the most important aspect of any musical project. Falling into the monotony of guitar-punk bands across the internet can be avoided through the addition of more modern, electronic elements, however, this too can bring about issues in authenticity. It would be counterproductive to classify any sound not made directly by a human playing an instrument as inauthentic or cheap, but at the same time some balance must be achieved between the futuristic synthesizer/turntable sounds and the in-the-moment, human quality of music. Another important aspect of a band’s individuality is its influences. Contemporary bands oftentimes fall into the trap of borrowing from each other too much, which can lead to an overabundance of bands with the same set-up and sound. Montreal’s own She-Devils seem to have fixed this problem by combining a relatively predictable modern set-up with an unusual pallet of influence. By fusing the modern, sample-based DJ sound with a vintage songwriting approach, the She-Devils have created a fresh, new sound that pushes forward into the realm of electronic music while also hearkening back to the psychedelic feel of the 1960s. The first few moments of the album feel like the beginning of a time traveling movie. The machine whirs to a start and the listener is engulfed in a peculiar dance tune with Audrey Ann’s slightly reverberated, droning vocals floating over the top of Kyle Jukka’s distorted rockabilly loops. The song has this strange sense of familiarity evoking imagery of a character floating through time and space into another dimension’s version of the sixties. Although the melodies are similar, they have been reinterpreted with contemporary sense of eeriness and darkness. High Intensity lyrics such as “don’t try to resist me” and “touching the things that you touch make me feel like I can touch you” morbidly crawl out of Ann’s mouth as Jukka’s loops evolve into dramatic noise jams reaching new levels of distortion with each repetition of the melodic idea. The bands aesthetic choices culminate in a unique, refreshing sound resulting in an especially interesting EP in a crowded music environment. Finding a new sound is probably the best way to separate yourself from the pack in music, however, it can also bring up problems in composition. Sometimes bands spend so much time conjuring up a new sound aesthetic that they end up in a place where their music is so specific that it is hard to avoid writing the same song over and over again. The She-Devils have addressed this problem by providing the audience with three entirely different pieces along with a completely backwards remix of the first song on the album. Come is a dance track through and through. Although it contains the previously mentioned She-Devils quirks, it seems like the tune that would get the crowd moving in the live scenario. After this song floats off into space, a six minute slow piece drones on into oblivion providing the album with contrast. The light-hearted nature of Come is juxtaposed against the newfound intensity and drama in Audrey Ann’s vocal delivery. After the dust from Where There’s No One settles, the She-Devils present a short third song that finds a happy medium between the first two. The lightness of instrumentation found on Come is now combined with the dramatic vocal presence of Where there’s No One again taking the listener to another level of the She-Devils evil layer. 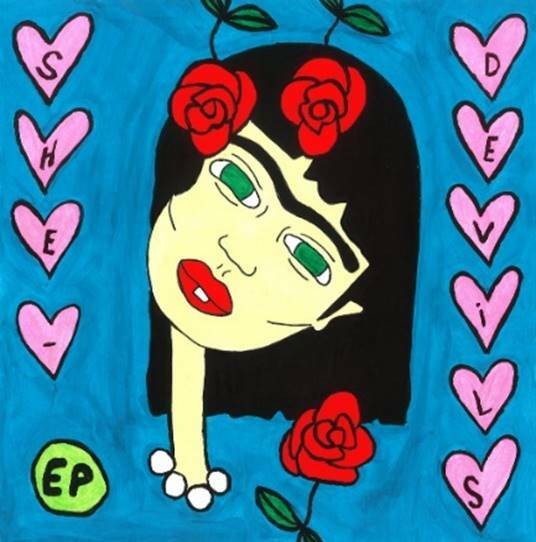 The She-Devils’ ability to recreate their ideas is extremely evident on their self-titled EP as they effortlessly glide from song to song in a dynamic way never approaching staleness. When I first hear the song Come, I was excited to know that the She-Devils were releasing a new EP. I then ventured over to their Bandcamp page and was a bit disappointed to see that the EP would only be four songs including one remix (I’m not a huge fan of remixes). The shortness of the endeavor made me afraid that the band would become a sort of one hit wonder without the ability to put together a cohesive collection of songs. The remix also had me worried because I often find it to be a cheap way to add length to an album. Now that the whole work is available, I understand that the remix is sort of a metaphor for the piece as a whole. Here the band has taken their fun dance track and completely turned it on its head; an essential She-Devils technic. Their ability to generate new ideas and reinterpret their old ones is apparent throughout the EP and I am very confident that any full length album or performance that they put together will be creative and different. This entry was posted in CKUT programming and tagged Montreal, Pop, Review, S/T EP, She Devils on January 19, 2016 by librarian.